Cardiff/Miller, The Infinity Machine, (detail) 2015, installation in progress, Byzantine Fresco Chapel, The Menil Collection, Houston. Courtesy The Menil Collection and George Hixson. 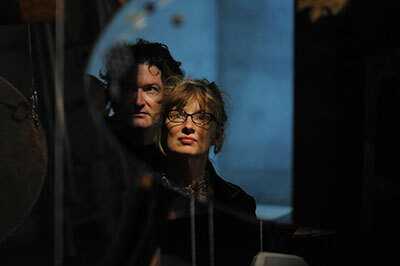 George Bures Miller and Janet Cardiff. Courtesy The Menil Collection and George Hixson. In the mid-1990’s, Francois de Menil designed and constructed the Byzantine Fresco Chapel to house and honor a number of Cypriot frescoes the architect’s mother Dominique de Menil, had rescued and restored. The frescoes’ home was the result of a cooperative effort shared by the De Menils and the Orthodox Church of Cyprus to temporarily house the frescoes in Texas. The Menil Foundation raised $4 million dollars to construct the Chapel, but when the frescoes were returned to Cyprus in 2012, the chapel sat vacant for several years. Undoubtedly the Menil spent these years searching for a way to use the unique space that honors its history as well as that of the paintings, while also maintaining its connection to the history of the Cypriot chapel outside of Lysi that inspired the Byzantine Fresco Chapel’s design. In January, the chapel was finally put to use, this time, as the home for a series of temporary, site-specific installations. While there has been a trend of artists, curators, and organizations doing pop-up exhibitions in spaces, creating a sense of urgency that allows them to counteract the “there’s plenty of time to see it” line of thought that tricks visitors out of seeing longstanding exhibitions, the Menil sought to maintain the nature of the Byzantine Chapel as a meditative space. Much like its neighbor The Rothko Chapel, it offers a tranquil, reflective environment reminiscent of a sacred space more than a contemporary art gallery. In a fit of serendipity, the new series of programming launched last month wasn’t entirely intentional. The first artists to work within the Chapel, renowned Canadian artists Janet Cardiff and George Bures Miller, were initially commissioned by Director Josef Helfenstein to participate in the Menil’s exhibition Experiments With Truth: Gandhi and Images of Non-Violence. Instead of participating in the exhibition in a traditional way, they opted to install in the Chapel and the result, The Infinity Machine, is an appropriate addition to the space. Cardiff/Miller, The Infinity Machine, 2015, installation in progress, Byzantine Fresco Chapel, The Menil Collection, Houston. Courtesy The Menil Collection and George Hixson. Upon entering the Byzantine Fresco Chapel, viewers are presented with a giant, revolving mobile of antique mirrors. With some of the mirrors over a century old, visitors have a unique opportunity to gaze into the past and contemplate the generations of owners who have looked into the mirrors before them, and what they may have seen. Each mirror opens its own history to those who gaze into it, allowing the visitor to lose their individual identity and become part of humanity’s collective history. As the collection of mirrors revolves within the room, smaller mirrors whirling like satellites as they orbit in the outside circle, reflect light from the walls, casting a kaleidoscope of various-colored shapes across the rooms. Simultaneously, the mirrors cast shadows throughout the Chapel’s interior. Negative and positive space move around and cut through each other. 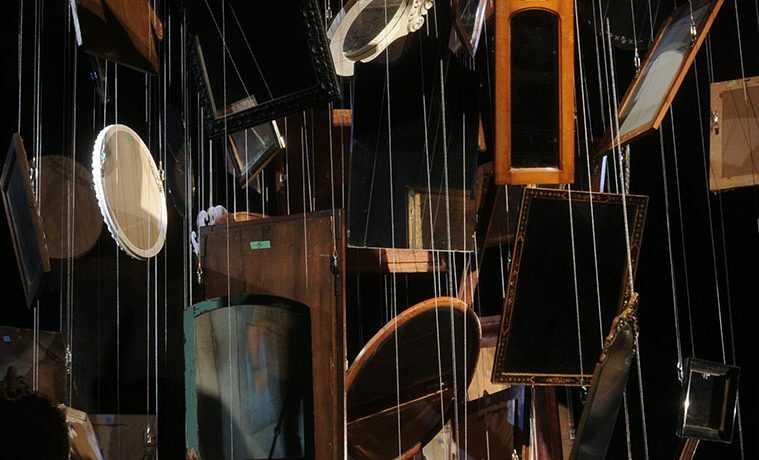 This displacement becomes vastly more noticeable on the back wall, where the entire mobile casts a shadow, and the wires holding the mirrors disappear. 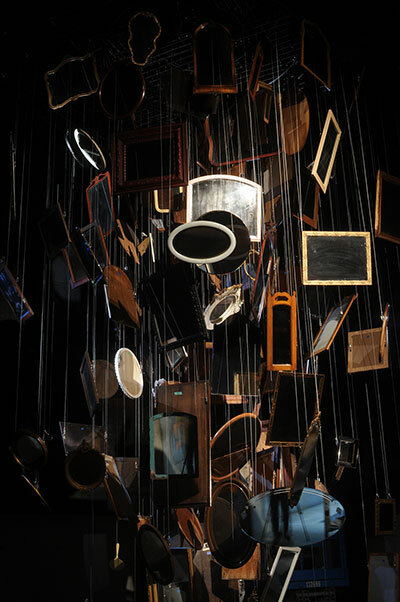 Here, the mirrors become a churning, black mass, reflecting nothing, but becoming a representation of the heavenly bodies denoted in the aural aspect of the installation. The Infinity Machine, through this aural presentation, acts as a cosmic concert. After reading on the Pythagoras concept of “the music of the sphere,”Cardiff deepened the installation by adding the “universe’s own symphony.” Solar winds, the streams of energized particles flowing outwardly from the Sun, move through the electromagnetic ionospheres of celestial bodies. That movement can, and for this installation, has been, converted into sound, producing an aural experience of the cosmos. To present these, Cardiff and Miller sought the assistance of NASA, who provided recordings documented by both Voyager 1 and 2 on their interstellar missions. The interactions these recordings produce supply The Infinity Machine with a planetary soundtrack that moves through waves, at certain times dense and oppressive and at others light and uplifting. Though this cosmic machine will leave in a year, the ideas it explores and its reflection of the Byzantine Fresco Chapel’s votive nature will continue – its space evolving and forever offering itself to visitors. Michael McFadden is a Houston-based writer and arts administrator. He holds an MA in Arts Leadership from the University of Houston's College of the Arts and has worked extensively with the Houston arts community. Learn more about him at pugintheair.com.